Review written by and copyright: Rick Curzon (19th August 2018). First off, this is a very silly film and hardly what anyone would call good; much of the acting is poor and the script isn’t up to much as it doesn’t quite know if it’s a satire, serious action flick or meant to be a comedy ... or all at once as the tone is all over the shop. Over the decades I’d heard that this was a Troma film and instantly assumed it would be like other Troma efforts like The Toxic Avenger (1984) or The Class of Nuke ‘em High (1986); campy, grisly, nasty and shot for about tuppence on 16mm and looking extremely grainy with clunky mono sound. This is actually a Troma pickup, which is to say it was shot by an independent outfit who then sold it to Troma. It’s surprisingly slickly done on 35mm film and has a rather well done MTV look and an effective Ultra-Stereo surround track. It has a cracking electronic score by Jon McCallum who obviously thought he was scoring a more serious movie; one to get on CD if possible. Despite all the good aspects it’s pretty lame because it doesn’t quite work as a comedy and director Peter George seems to want to shoot an action film, but without the budget or time to get it all correct. It’s a shame because with a bit of a polish the script could’ve worked and with a little bit more time and money the action could’ve been improved. As is, this is sporadically very amusing ... sometimes deliberately and at other times it’s unintentional. Colours are generally strong favouring the warmer end of the spectrum with naturalistic Flesh tones. Most of this film was shot exterior with bright, sunny California locations and in great weather. The surf scenes are evocative and beautifully done coming off very well in this transfer. The master used for the Blu-ray is clean and without any print damage that I could see. It’s a very ‘80s looking production with that glorious grainy haze over most of it. Black levels are pleasing and are mostly deep and rich; crush is only very occasionally present but is almost certainly a part of production conditions re budget, time and original lighting. Contrast is par for the course for modern transfers avoiding blown out highlights; when this was put on VHS and Laserdisc back in the day the transfer would have been more contrasty to compensate for the lack of definition but here allows detail to show through nicely. This will never touch a new digitally shot production for textures but still pleasing and about as good as we can expect. I couldn’t see any signs of digital tinkering like edge enhancement or DNR and The encoding and grain management are good. Well done 88 Films! A surprisingly effective, if simple 2.0 Ultra-Stereo track given the lossless treatment. This will win no awards as even for it’s era it was low budget and low ambition but the score is well handled with good fidelity and no distortion. Dialogue is mostly clear and for those brief moments where it isn’t the subtitles are most welcome. The surrounds are mainly used by the score but occasionally we get some sound effects in the fight scenes, water sounds in the surf bits etc. Newly recorded piece is the best extra on the disc. Shell is enthusiastic and has plenty of amusing anecdotes about the film and his career. Brief, superficial, vintage pieces from prior VHS and / or DVD releases. Both director and producer chat about the production and give us some superficial information about the film’s creation. A few brief scenes with no sound and commentary from the director; nothing remarkable here, but nice to have if you’re a fan. Hyperbole, cheesy narration ... you know the score. 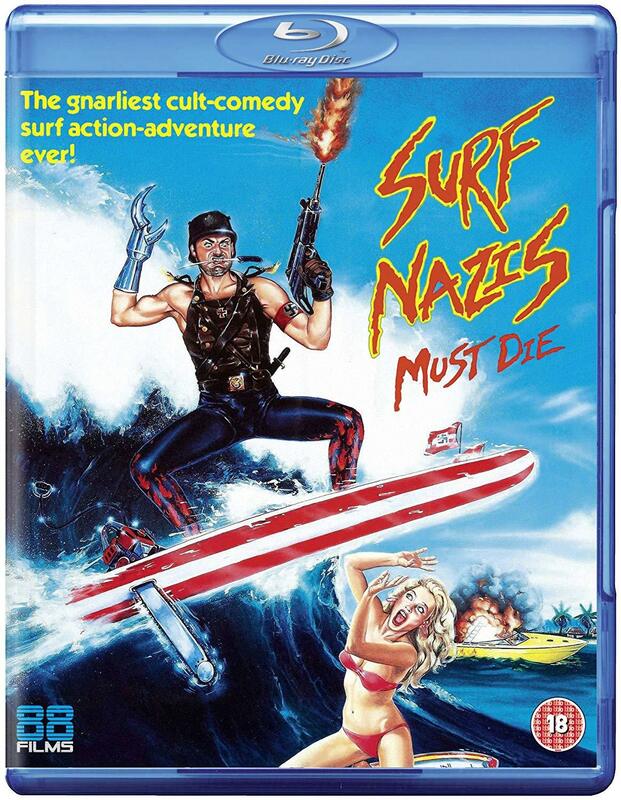 Typically silly comedy Troma extra; a vintage promo for the video release of Surf Nazis Must Die. Single disc keep case with vintage artwork on the cover. It presents it as an out-and-out comedy but I found the overall tone similar to something like Savage Streets (1984); knowingly cheesy, sometimes overtly funny, at others disturbing and paddling about in an offensive pond. This is an easy recommend. Decent picture and sound on a cheesy film that’s an uneven good time when sober, a enjoyable riot with pals, beer and pizza on a Friday night; a real party film. This is one I’ve been meaning to see since first reading about it in the late ‘80s and for whatever reason it has eluded me till now. The disc is very reasonably priced and presentation is as good as can be shy of a new 4K scan. It’s single layered but that is more than sufficient for the brief film and scant extras.